The Kirkland Nitrile Exam Latex Free Disposable Gloves are indispensable. These gloves are effective in protecting your hands on whatever you work with. I primarily use these for household cleaning. Whenever I touch chlorine or other cleaning agents, I wear these to shield my hand from the harsh chemicals. I also use these when I am cooking to protect the food from contamination. I essentially rely on these disposable gloves whenever I don’t want to wash and scrub my hands from whatever I am handling. 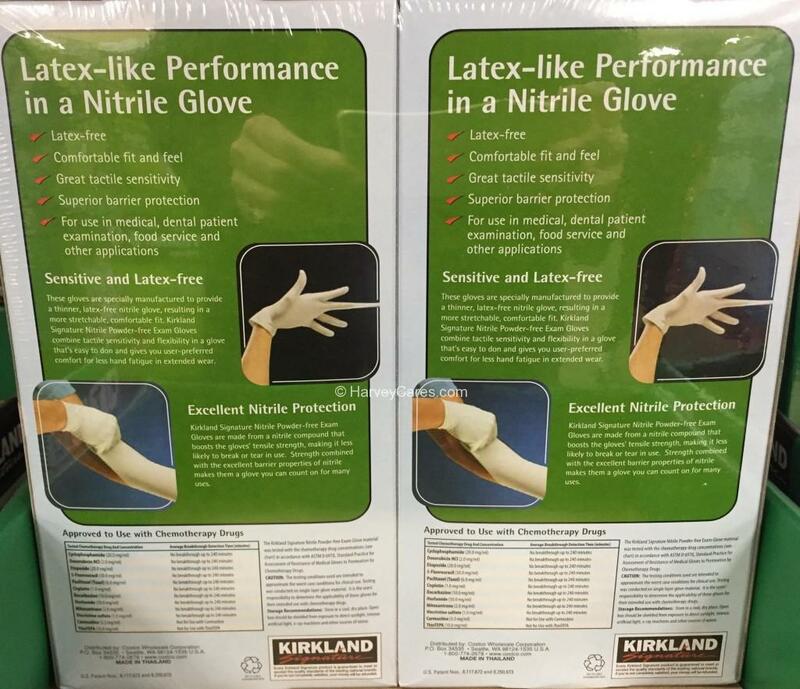 Kirkland Nitrile Exam Latex Free disposable gloves are latex free. They are also powder free. No more allergic reactions to latex. And no more annoyance from white powder. It has a very comfortable feel to it and fits perfectly. There are 3 available sizes: Small, medium, and large. These gloves offer great tactile sensitivity. You don’t feel numb to what you are doing or touching. The layer is actually quite thin (but strong) offering you great sensitivity to what you are working on. It also offers amazing barrier protection. 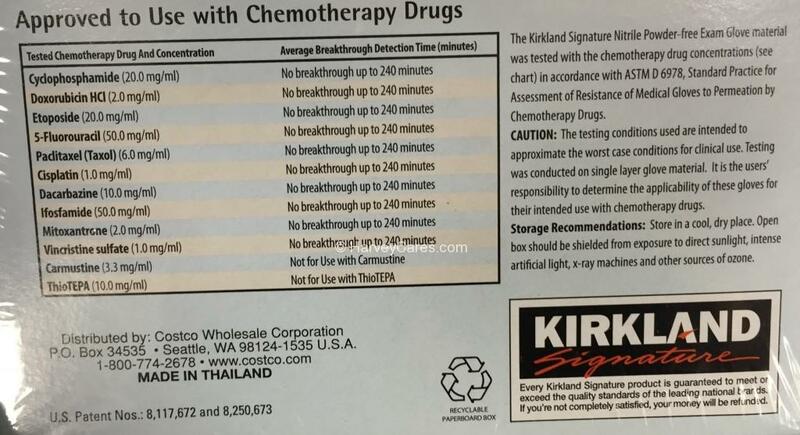 It is even certified to handle certain chemotherapy drugs. See testing certification results on the bottom of this article. 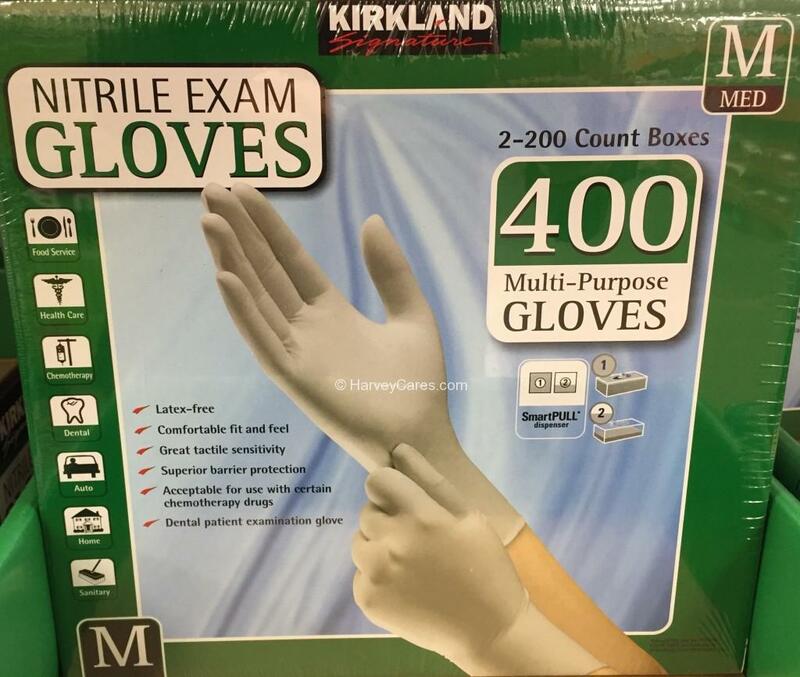 Kirkland Nitrile Exam Latex Free Disposable Gloves have many uses. It is ideal for food service, health care, chemotherapy application, dental, auto, home, and/or sanitary applications. The Kirkland Nitrile Exam Latex Free Disposable Gloves are reliable gloves. They will definitely make your life easier! Are you considering different options or want to take a look at alternatives? Looking to purchase the Kirkland Nitrile Exam Latex Free Disposable Gloves? Amazon currently has the best price for this item (with shipping inclued). Click here to get directly to the Amazon product page. Back to the good stuff! 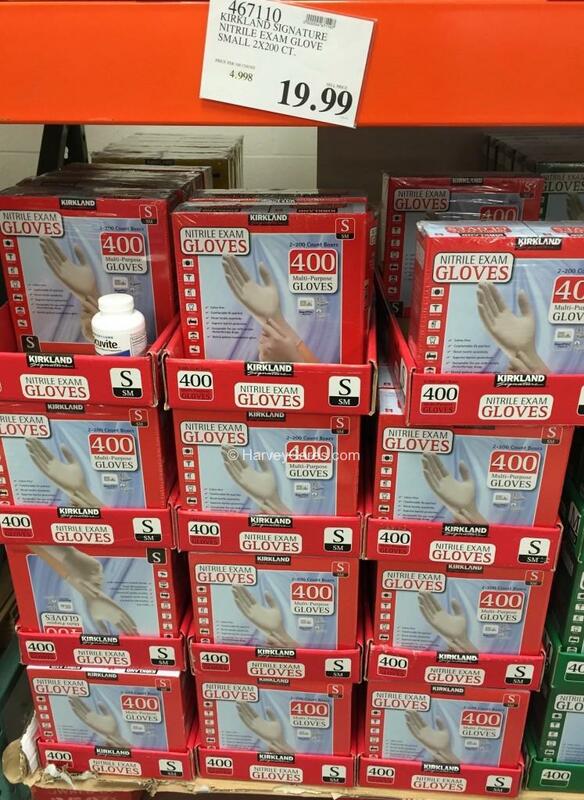 Take a look at our detailed product review of Kirkland Nitrile Exam Latex Free Disposable Gloves below. Nitrile glove with latex-like performance. 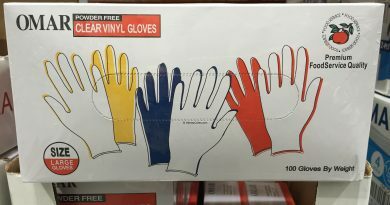 The disposable gloves are latex-free but latex-like. Very comfortable feel and great fit (choose from small, medium, or large sizes). 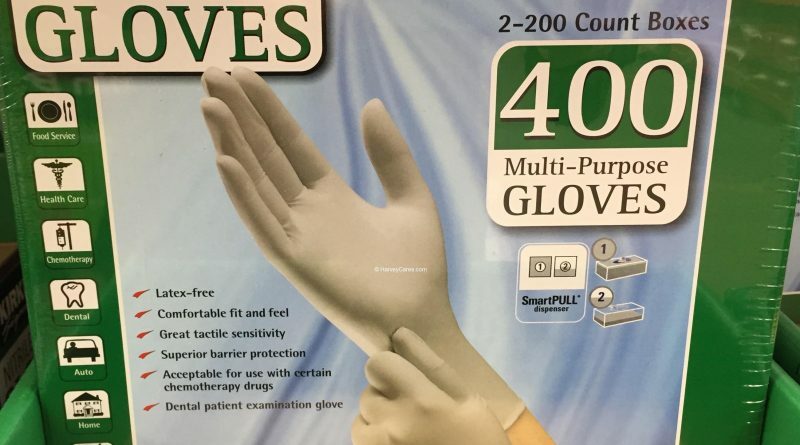 The large disposable gloves are very big. So unless you have huge hands, go with the medium one. These are also a bit stretchy so it fits your hand well. There are many practical and useful applications for these Kirkland Nitrile Exam Latex Free disposable gloves. The chemotherapy drug permeation (breakthrough) test results are on the bottom. Cyclophosphamide (20.0 mg/ml): No permeation (breakthrough) up to 240 minutes. Doxorubicin HCI (2.0 mg/ml): No permeation (breakthrough) up to 240 minutes. Etoposide (20.0 mg/ml): No permeation (breakthrough) up to 240 minutes. 5-Fluorouracil (50.o mg/ml): No permeation (breakthrough) up to 240 minutes. Paditaxel (Taxol) (6.0 mg/ml): No permeation (breakthrough) up to 240 minutes. Cisplatin (1.0 mg/ml): No permeation (breakthrough) up to 240 minutes. Dacarbazine (10.0 mg/ml): No permeation (breakthrough) up to 240 minutes. Ifosfamide (50.0 mg/ml): No permeation (breakthrough) up to 240 minutes. Mitoxantrone (2.0 mg/ml): No permeation (breakthrough) up to 240 minutes. Vincristine sulfate (1.0 mg/ml): No permeation (breakthrough) up to 240 minutes. Carmustine (3.3 mg/ml): NOT for use with Carmustine. ThioTEPA (10.0 mg/ml): NOT for use with ThioTEPA. Looking to Buy Kirkland Nitrile Exam Latex Free Disposable Gloves Now? 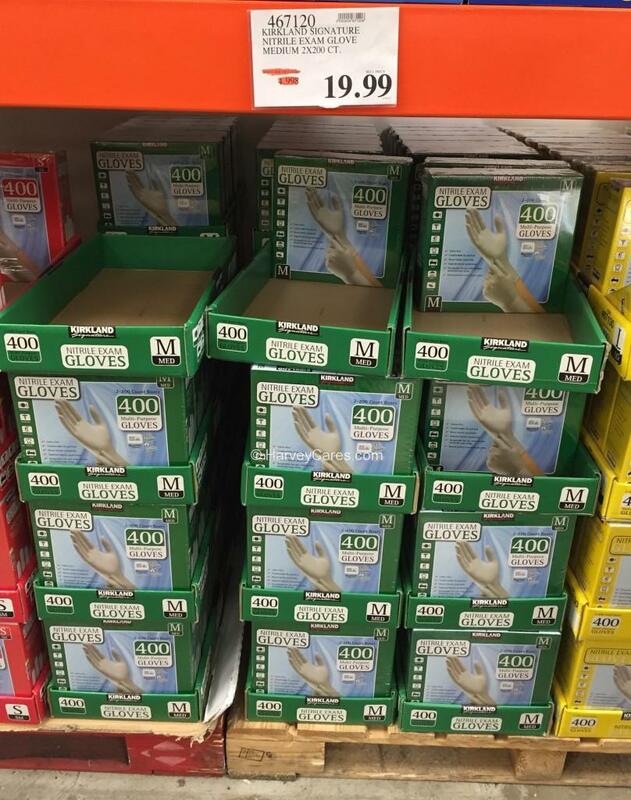 Kirkland Nitrile Exam Latex Free Disposable Gloves is currently selling at my local Costco Warehouse for $19.99 (Small, Medium, or Large sizes). I have seen a discount on this product before. The item is also available on Costco.com at the same price. However, there is a $2.99 shipping and handling charge. If you are able to, grabbing it at the warehouse would be best! Note: Most people will buy this size unless you have very small (or big) hands. 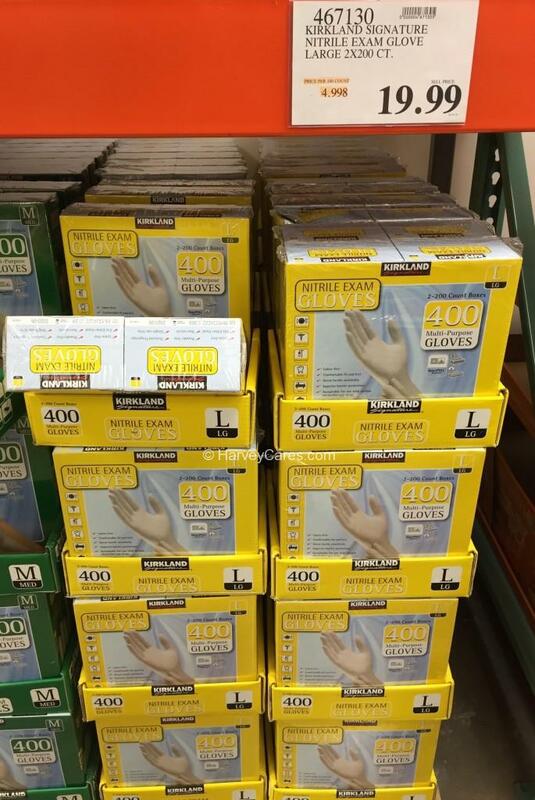 Have you bought the Kirkland Nitrile Exam Latex Free Disposable Gloves before?